It all started with a simple message on Instagram. I spend my days browsing through social media for work, for this blog, and for my new baby, Hanamayari. One day, while browsing through Instagram Stories, I saw Tere Pineda's post that she was selling these beautiful, handmade bead jewelry. I'm a sucker for anything local, so the craftsmanship of the pieces easily caught my eye. But, I couldn't help but wonder why she was doing it. After all, she is a first year medical student in a prestigious University who had a whole life (and med) ahead of her. After a few IG stories, I saw how she get a hand of these in the first place. I messaged her one day to ask how much she was selling the jewelry cause I wanted to buy and support her cause. Eventually, we started talking. I'm still surprised, to this day, how many online turned offline friends I've made. I mean, imagine, I'm a few batches ahead of her, and I probably seemed sketchy. Kidding aside, I told her what I wanted to purchase, and set a date to meet up. A week passed before I found myself rushing to Starbucks (hello tardiness) and figuring out who she was in the sea of students populating the place. I turned my head back and forth, and spotted this girl wearing something I'd wear if I were a lot skinnier.... or if I had the luxury to fix up (#mombie). Her hair was tossed back in a half pony, with a tropical bohemian look going on. She had her eco bag, and was sipping tea (?). I rang Tere a call, and there, tama nga ako - siya yun. Tere attended this beadwork talk in her school where she met L**** a.k.a. Liwayway (out of respect, I shall not disclose her name so lets use the pseudo name instead). Tere wanted to know more about why she does this, and she mentioned how Liwayway was trying to raise enough money to fly in her other family members who were stuck at a military camp in her area. The story moved Tere, and she couldn't stop thinking about it. So she and Liwayway talked further, even meeting on days Tere had no school just to see how she could be of help to Liwayway's community. Liwayway was a Lumad originally from Davao del Norte. For four years, she had been under the care of different evacuation centers - whether it be schools, or government provided, and she solely relies on beadwork as a main source of income in Manila. To cut the story short, Liwayway agreed to Tere's offer of selling her beads. What started out as a simple IG Story became a source of support from all types of people, including myself. From there, Tere created Tahing Tahanan as an avenue to support local communities, minorities by providing them a platform for awareness and empowerment. The fact that this is what Hanamayari is essentially headed really WOW-ed. Seriously, I just wanted to give Tere all the help I could - to build her brand's awareness, to take part & also be an agent of change. She has such a genuinely good heart. You could see the lengths she'd go for to establish this, help Liwayway and make this passion project come to life! I offered Ang Buhay Lokal & Hanamayari as a platform to help spread awareness, and to hopefully give her some traction in making people know of her cause, her advocacy. Thankfully, she accepted. So here we are now, a few hours before we launch the Manobo Bead Collection on Hanamayari. Here are just some of the items I handpicked for those who are interested (if not, I'll probably just buy them all). Sure, people maybe wondering if we are disrespecting their culture in any way. According to Liwayway, we aren't. In fact, this is why they make these available to us. If there's something I know and have learned throughout our family travels, it's that these people know what they're doing --- and they wouldn't suddenly just go overboard and turn back from tradition if it wasn't allowed, or necessary to. 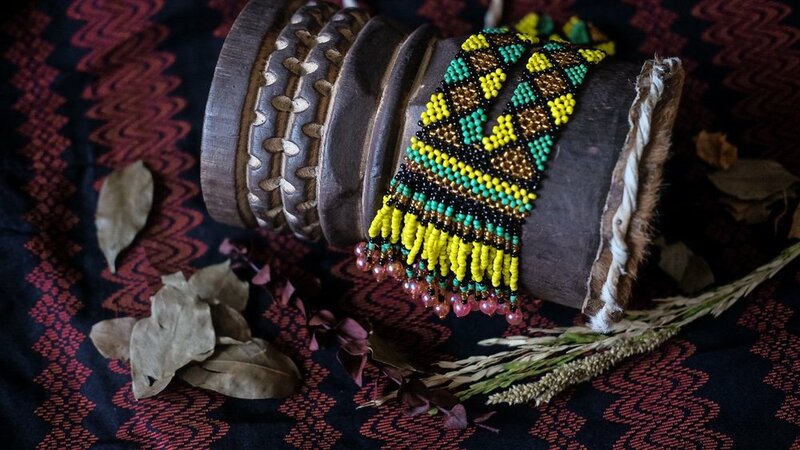 Liwayway has been conducting these simple beaded jewelry workshops to not only serve as a source of income, but also shed some light on who they are, where they came from, and what they want to share to the rest of the world! That's it! I hope you enjoyed this story, and I'm praying you support Tere & Liwayway's cause by going to Hanamayari this weekend, or ordering directly from Tahing Tahanan! Every peso spent for these tedious, handmade pieces of art will go back to Liwayway and her community!